Register for the next AMRI meeting, to be held on May 13th 2019 in conjunction with the Crafoord Symposium, here! Rediscovering pelagic biodiversity: Progress, promise, and challenges of metabarcoding of microbes to mammals. SciFest is, as the name suggests, a science festival, combining the three disciplinary domains of the University. Researchers, teachers and students from all parts of the University come together with exhibitors such as high schools and companies, to provide a three-day educational experience including interactive demonstrations, hands-on activities, scientific shows, and engaging scientific lectures. SciFest invites pupils, teachers and the general public to experience some hands-on research and science. Welcome to participate as an exhibitor at the scientific festival SciFest 7-9 March 2019! It is time to start thinking about SciFest 2019! We hope that you want to join as an exhibitor and present your research! SciFest is an activity where scientists from all scientific fields, companies and organizations can meet and present their research. The target group is mainly children and young people and the purpose is to raise the interest in science, attract more students to Uppsala University and to visualize the work done at the university. SciFest 2019 takes place on 7-9th of March at Fyrishov. Thursdays and Fridays are open for schools - from lower secondary school to high school - while the program on Saturday is open to the public. Since SciFest aims to a young public we strongly encourage that at least one person in each stall should be able to speak Swedish. Last year, SciFest offered 69 different exhibitions and a full-featured stage program with Science Slam, lectures and a physics / laser show. Due to the young target group, we recommend that the activities have an interactive design. We hope you want to participate so that we can jointly complete the 2018 program with a wide range of program items. HOW CAN I CONTRIBUTE AS AN EXHIBITOR? As an exhibitor, you can choose between arranging a bookable workshop or a non-stop activity. Participation is free of charge. All that sign up as exhibitors are invited to workshops (15 November and 5 February) where you can get help with how to design your activity. HOW DO I REPORT MY INTEREST? Signing up as interested is not a binding registration. The deadline for definite registration is December 4th. For general questions about SciFest, contact Project Manager Katarina Holmborn Garpenstrand, at katarina.garpenstrand@uadm.uu.se or 070-167 9473. Workshop: a 25 sqm stand with 2 tables and 16 chairs. On Thursday and Friday, the activity is divided into bookable passes with drop-in activities in between, while Saturday is a whole-day drop-in activity. Electricity, light and Wi-Fi included. Non-stop: is an open area with 1 table and 3 chairs. The activity is based on spontaneous visits during all three days. Electricity, light and Wi-Fi included. The Aquatic Microbial Research Initiative (AMRI) Distinguished Lecture Series begins 21st February at 12:15 room P216 at Stockholm University. Rachel Foster from AMRI and DEEP hosts microbial oceanographer, Ramon Massana from Institut de Ciències del Mar in Barcelona (Spain). Ramon Massana has worked on the diversity and distribution of marine protists. Recently he is focused on opening the black box of heterotrophic flagellates, a currently less understood microbial group in marine environments, and will give a seminar entitled, "Heterotrophic grazers in the ocean". All are welcome. Interested in meeting Ramon? Please contact Rachel.Foster@su.se. The symposium is free of charge and open to the public but registration is required for all participants. Limited number of seats. Please state eventual food preferences or allergies in the registration form. Our all-hands AMRI Kickoff will take place February 7-8th in Uppsala. We will start with a dinner on the evening of the 7th in Uppsala, and then hold our kickoff meeting the next morning, Friday, February 8th. This meeting is planned in conjunction with OIKOS 2019. 16.45 Wrap-up. What’s next for AMRI? 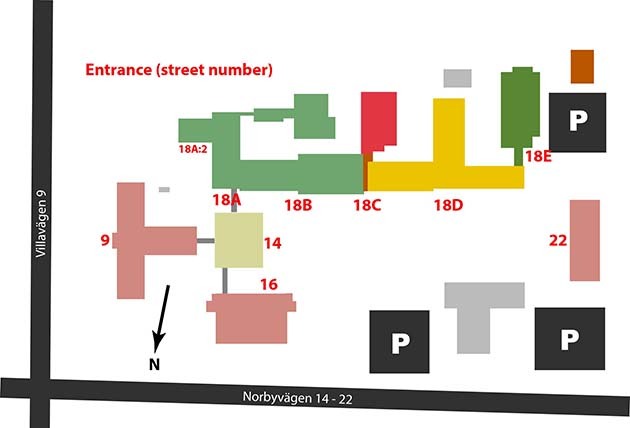 The dinner on the 7th of February will be held at the Evolutionary Biology Center (EBC), Uppsala University, Norbyvägen 18C (one floor up, outside teaching rooms 4-6). The conference on the 8th of February will be held at Lindahlsalen, Evolutionary Biology Center (EBC), Uppsala University, Norbyvägen. The Faculty of Science and Technology welcomes everyone to the yearly Celsius-Linnaeus lecturers on 7 February, starting at 09.15 in Siegbanhsalen at the Ångström Laboratory. The next OIKOS conference will take place in Uppsala February 5th to 7nd 2019. Our AMRI kickoff will take place February 7-8 in conjunction with the OIKOS conference! The ocean microbiome – the complex set of microorganisms in the sea - plays a critical role in the global cycling of elements necessary for life. Prof. Mary Ann Moran is a leading authority in research to identify how marine microorganisms carry out biogeochemical cycling, with particular focus on deciphering the molecular mechanisms that regulates the fluxes of sulfur and carbon. Prof. Moran has pioneered the genetic analysis of complex natural communities, both in genomics and in microbial gene expression (metatranscriptomics), providing knowledge necessary to interpret the role of microorganisms in a changing environment.